What do you say to that, other phone makers? 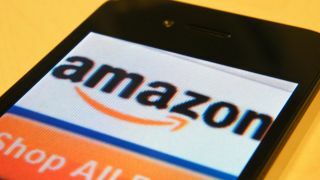 The long-rumored Amazon phone will reportedly sport enough sensors to rival Microsoft's Kinect, and those sensors will enable some unique forms of interaction. The Amazon smartphone will feature four infrared cameras on its front so it can effectively track the position of users' faces in relation to the display, according to BGR, which spoke with "multiple trusted sources" on the matter. Perhaps even more revolutionary than this set-up will be the Amazon handset's tilt controls, which may aim to make the large phone (4.7 inches, according to whispers) easier to use with one hand. It seems these tilt controls will not only replace existing essential functions, but also create new features, like revealing extraneous but helpful information without requiring touch interactions. For example, tilting the Amazon phone in the maps app might reveal Yelp ratings for any visible restaurants. Or tilting the phone could reveal labels beneath icons in apps where they aren't normally present, in case you forget what a button does. The tilt gestures would be present in Amazon's included first-party apps, of course; tilting in Amazon's video store could reveal IMDB ratings, and moving the phone on Amazon.com product listings might flip between photos. However, the new controls might also cause menus that previously would have been accessed with a tap to slide onto the screen when the phone is tilted in the corresponding direction. Tilting could reveal the X-Ray menu in the Kindle app, or a photo pane in the messaging app, or extended forecasts in weather. And really obvious functions - like scrolling up and down in books and websites when the phone is tilted - would be possible as well. There's one more new feature of note, sources said: the Amazon phone will have special optical character recognition software that can interpret and convert text captured using its rear camera. Using this function you might snap a photo of a business card to have the phone automatically add information to your contacts, or be able to quickly translate signs written in a foreign language. There's plenty more we'd like to know about the Amazon phone, but for now there's no official word. That could change any time, so keep watching for more info.